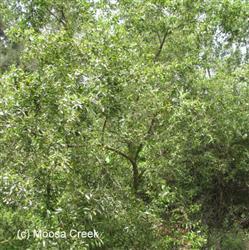 Salix laevigata, or red willow, is a fast growing winter deciduous tree that is a lover of water and is useful in erosion control and runoff areas. The foliage is a slender light green, finely toothed leaf that is shiny on top, with yellow midveins. The twigs are a orange to red color and are used in Nest construction and shelter for the Western Tiger Swallowtail. The foliage and flowers also attract many butterfly species, from spring to fall.